Invented more than a century ago in the UK, the simply designed drawing pin is hard to know how it could be improved… unless you stick a finger into a box of these pins to try to pick one out just one from the pack, they hurt! 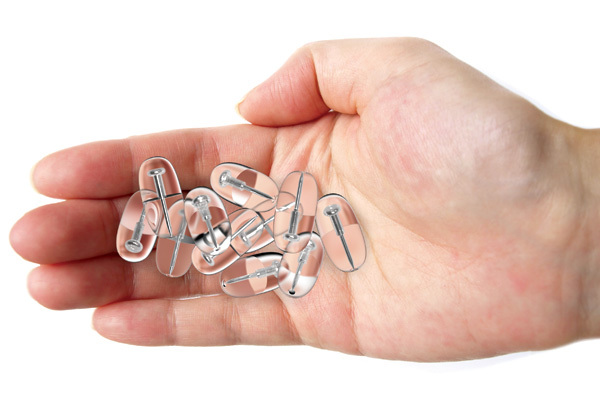 Designer Toshi Fukaya has just made the pins just a bit safer. He redesigned the thumbtack using a biomimetic model: a cat or it’s claws, to be specific. A cat can expose or withdraw his claws, and so now can Fukaya’s new biomimetic design of a drawing pin. Winner of a 2011 Red Dot Design Concept award, his design is covered by a hollow silicone sheath, the pin is not exposed until it’s pressed onto a hard surface like a board or a wall. A hundred year old design made safer by biomimetic design!